All India Sainik School Entrance Exam Results 2019 (AISSEE Region wise Results): The result for All India Sainik School Entrance Examination (AISSEE) 2019 has been released. The result is available on the respective Sainik School official websites. Sainik Schools conduct entrance examinations for admission to class 6 and class 9. Students who appeared for the entrance examination can check their result on the Sainik School website to which they have applied for admission. Students who has qualified in the entrance examination will now go through medical examination and subject to satisfactory performance in the medical test will be admitted to class 6 or class 9. 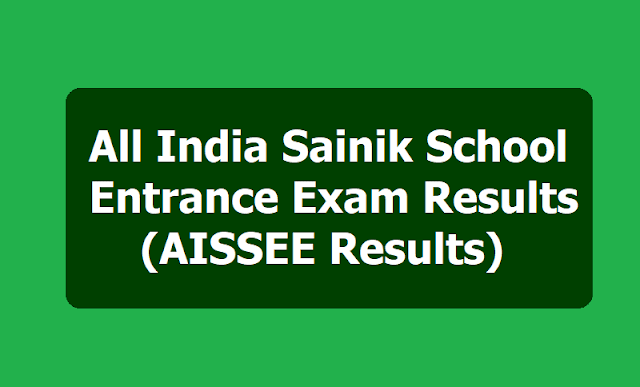 AISSEE Sainik School Entrance Exam Results 2019 Declared at sainikschooladmission.in: AISSEE 2019 Results for All India Sainik School Entrance Exam have been declared by the Sainik School Society on its official website - sainikschooladmission.in. The Sainik School Society had organized the AISSEE 2019 exam on 6th January 2019 for candidates seeking admissions to Class VI & IX in Sainik Schools across the country for which the entrance exam is scheduled for April 2019. How to check the AISSEE Sainik School Entrance Exa Results 2019? Step 1: Go to the Sainik School website of your region. Step 2: Click on the AISSEE 2019 link. Step 3: Click on the result link. Step 4: A pdf will open. Download and check for your roll number in the pdf. The pdf released has category-wise roll numbers of the students who have qualified in the entrance test. The Sainik School entrance examination was conducted on January 6, 2019 at centres across India. What after Sainik School Result 2019? Students who have qualified in the entrance examination will now go through medical examination and subject to satisfactory performance in the medical test will be admitted to class 6 or class 9. The pdf released has category-wise roll numbers of the students who have qualified in the entrance test. Candidates who had appeared for the Sainik School Entrance Exam can follow the instructions below and check their status. The All India Sainik School Entrance Examination (AISSEE 2019) results are released on the official website sainikschooladmission.in on February 3 midnight. The Sainik School Society had conducted a national-level entrance examination on January 6. The exam was held to select students for admission to classes 6 ot 9 in 26 Sainik Schools across the country. As per the schedule released by the exam conducting authority, interview and medical exam for the admission will be held from February 11 to 28, 2019. The Sainik School will release the final merit list including the waiting list on March 11, 2019. The exam for class 6 was held in English and Hindi. The question papers for class 9 was set in English only and students are required to answer in English. Sainik School results 2019, how to download: Firstly, Visit the official website, On the homepage, click on the result link flashing towards the left hand side of the page, Enter the necessary details like registration number etc.,Click on submit button., Your result will be displayed on the screen., Step 6: Download and take a printout of the admit card. How to check AISSEE 2019 Results? As per the Sainik School Admissions 2019 schedule the Interviews and Medical Test are scheduled to be conducted from 11th to 28th February2019, and the final merit list (including the waiting list) will be published on 11th March 2019. Admissions to Sainik Schools across the country will be made stringently according to the merit list only.